I think everyone is looking for the best carrot cake recipe. Now what exactly does that mean? In my view the first requirement is that it has to be super moist. This is accomplished by the addition of the oil and pineapple in this recipe. It also has to have just the right amount of sweetness, not too much and not too little. I’m sure that those shredded carrots lend some healthy sweetness to the recipe but who cares. We are talking about the most delicious carrot cake here. Let’s talk cream cheese frosting. This is literally the icing on the cake, right? This is the best part, in my opinion. It’s sort of like the sauce over the enchiladas. The enchiladas have to be good but it’s the sauce that really makes it. Same thing with carrot cake. That rich and creamy frosting is what really makes it. To make the very best cream cheese frosting you have to use quality ingredients. Use real butter and never margarine. Same goes with vanilla extract, use the real stuff. Now for the cream cheese, don’t bother with low fat. I guess I should never say never but if you want the ultimate carrot cake, use regular cream cheese. Here is another thing I want to mention. My sister reminded me of this. Check your baking powder, baking soda and other spices for their expiration date. It’s easy to forget how long you have had some of your ingredients so check out those dates. It really makes a difference in your final dish if those spices are old and have lost their flavor. Remember, everything needs to be fresh and up to date for optimum flavor. And we are definitely looking for optimum flavor. Want to Maximize Flavor Even More? Here is a step that is not in the recipe. You can choose to do this step or not, it’s up to you. Here is my secret: the recipe calls for walnuts or pecans. I happen to love the rich flavor that roasting the nuts brings to the dish, so I roast them. Here is what you do. Place your nuts on a cooking sheet, in a single layer. Roast them in a 350 degree F. oven for 8 to 10 minutes or until browned a bit and take them out. That’s it. You will be adding wonderful flavor to your carrot cake. So let me show you how to make the very best carrot cake recipe. Preheat the oven 350 degrees F. and grease and flour two 9 inch round cake pans. Add the flour, baking powder, baking soda, salt, cinnamon and sugar in a large mixing bowl or a kitchenaid mixer if you have one. Pour in the oil and the beaten eggs and mix well. Now add the carrots and the drained pineapple and mix until well blended. Pour cake mixture into 9 inch cake pans and bake for 35 minutes or until a tooth pick comes out clean or a 9 x 13 pan and bake for 40 to 45 minutes. Mix butter, cream cheese and vanilla in a bowl with a mixer until well mixed and creamy. Add powdered sugar 1/2 cup at a time and mix with each addition until smooth and creamy. Now go ahead and take a taste. You know you want to. It’s so nummy I can never resist. Try not to eat too much. Remember we have to frost the cake. 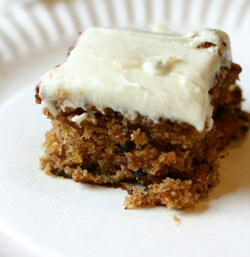 This homemade carrot cake should be stored in the refrigerator if there are left overs. Not likely, but just in case. Want To Make Cupcakes Instead? Since cupcakes are the rage right now you can even make carrot cake cupcakes with this delicious carrot cake recipe. Pour the batter into cupcake papers and bake at 350 degrees F. for 20 to 25 minutes or until a toothpick comes out clean. This carrot cake recipe would be perfect for Christmas, Easter, Halloween, birthdays or any time you want to serve cake or cupcakes. It’s amazingly good I tell ya. I only make this when I have a lot of people over who will eat it, otherwise it’s a temptation that’s way too powerful for me. Remember, it’s delicious, and nutritious and it will make you ambitious! Yes it’s nutritious, remember the carrots?